Entrance to Jerusalem is blocked by huge hareidi prayer rally against the law that will punish hareidi men who do not enlist. Hundreds of thousands of hareidi protesters gathered Sunday afternoon at the entrance to Jerusalem, for a prayer rally protesting the law that the Knesset intends to pass which would place financial and criminal sanctions on hareidi men who refuse to enlist to the IDF. The organizers estimated that 500,000 people took part in the protest. Emergency aid teams from Magen David Adom and United Hatzala gave medical assistance to dozens of people who suffered weakness, difficulty breathing and light bruises. The law on hareidi enlistment was drafted by a Knesset committee headed by MK Ayelet Shaked of the religious-Zionist Jewish Home party. The political force that has lobbied most strenuously in favor of the law, however, is Yesh Atid, a secularist party that some say is largely preoccupied with anti-hareidi legislation. It is not clear if the sanctions stipulated in the law will ever come to pass, since they are scheduled to kick in 3.5 years from now. By that time – a new government will likely be in place, and it could decide to change the law. Despite universal mandatory conscription for Jews, thousands of young hareidi men aged 18 are exempted from enlisting to the IDF every year, by force of an arrangement that dates back to the founding of Israel. The arrangement, which allows hareidi men who study Torah full-time at yeshivas to avoid military service, is seen by many non-hareidim as an unjustified excuse for shirking a patriotic duty. Defenders of the arrangement note that the Israeli military has not made an effort to create an environment that is friendly to hareidim, who require strict observance of rules regarding modesty and separation between the sexes. 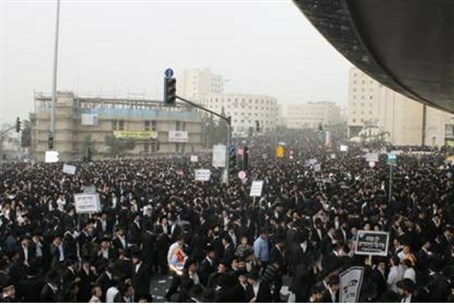 The religious-Zionist sector is of mixed opinion regarding the issue. On the one hand, religious Zionists are Israel's leading sector in terms of per capita enlistment, with a stress on combat units. On the other hand, Torah study is highly valued in the religious ZIonist sector as well. Religious Zionists Rabbi Yaakov Shapira, head of Merkaz Harav yeshiva and Rabbi Shmuel Eliyahu of Tsfat, despite rumors that he would not attend, were present.